Rocky Mountain Springs Lodge with the “Million Dollar View” located in the peaceful Village of Radium Hot Springs, in the Columbia Valley. Located high on the hilltop overlooking the Village of Radium Hot Springs the Rocky Mountain Springs Lodge is open from Easter to Thanksgiving. 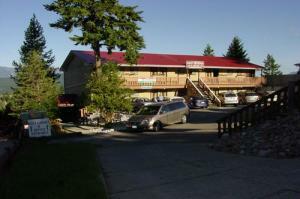 The Rocky Mountain Springs Lodge has ten beautifully appointed rooms with a variety of packages to choose from. Each room type with a “Million Dollar View” of the peaceful community below. Located only minutes from the entrance of Kootenay National Park and the world famous Radium Hot Springs a peaceful adventure is waiting for you. 1 night accommodation, Pool Passes for 2, Breakfast and a beautiful 3 course dinner for 2 in our very own Citadella Restaurant including a bottle of our House Red or White Wine. The Citadella, our cozy restaurant, is situated way above the Columbia Valley and has the most spectacular mountain views in Radium Hot Springs. It is a perfect place for you to relax after a long, day of adventure. You will love the delicious food, warm and delightful service, the relaxing atmosphere and the stunning sunsets from our balcony. Have you ever tried Hungarian food? Do not miss the opportunity to try Hungarian cuisine regardless of where you are staying in the area. The Citadella Restaurant, an ideal setting for weddings, birthdays, anniversaries and small gatherings. Open seven days a week from Easter to Thanksgiving.